3:13 moreover, it is God’s gift that all should eat and drink and take pleasure in all their toil. Today is the sixth day of Christmas. Just a reminder, the Christian Christmas Season isn’t the days before Christmas, it’s the days after Christmas. The Christian calendar counts the 12 days from the day after Christmas to Jan. 6, Epiphany. Today is the sixth day of Christmas. Epiphany was introduced into the Christian tradition in 361, six years before the Bible was codified in the current form. A portion of the Christian Church celebrates the visit of the Magi to the Christ child on Epiphany. Others commemorate the baptism of Jesus on Epiphany. Today is the First Sunday of the new Christian year. And, today, tonight, is also Watch Night. In the African American community, Watch Night services later tonight commemorate the evening of Dec. 31, 1862, as slaves looked to Jan. 1, 1863, and the implementation of the Emancipation Proclamation. The idea of a New Year’s Eve service actually is older than Freedom’s Eve, and in fact finds its roots in the Moravian Church and a 1733 New Year’s Eve service held in Germany. The Watch Night service obviously took on deeper significance on New Year’s Eve, 1862, when it was more important than any before or since, and the effects will still be observed in black communities tonight. In 1862, millions of American residents – not citizens, slaves with no rights – eagerly looked to the new year for the promise of hope. You can imagine their trepidation and excitement. Many of us share similar feelings, in our own ways, as we consider the year to come, 2018, less than a day away. January takes its name from the Roman god Janus. The dual-headed god of beginnings, endings, transitions and time. Like Janus, all day today, we look back on the year that was and we look forward to the coming year. I try to take time on New Year’s Eve for self-reflection, to consider the sort of person I’ve been, and the sort of person I’d like to be. Have I been as kind as I could be? Have I been considerate of others? how can I improve? What sort of person do I want to be in 2018? Today’s scripture reminds us that there is a time for everything. A time to ponder the past, and a time to focus on the future. All time for God is now. Yesterday, today and tomorrow are as one. Writer C.S. Lewis compares God’s ability to control time to an author’s control of time in a book. God doesn’t move from page to page, day to day, the way we do. God moves outside of time. For God, there is no yesterday or tomorrow. For God, there is only always now. When Moses meets God, God is introduced as “I Am.” A better translation is “I am becoming that which I am becoming.” God is more than now, God is always, ever-active, constantly in motion, constantly becoming – yesterday, tomorrow and always now. These words from Ecclesiastes remind us that there is a time for everything. But these words also are a reminder to try to follow God’s example, and be present in each moment, experience the now. Enjoy this moment, don’t worry about the past moment. Pay no mind to the next moment, be present in this moment, this time. Right now. It’s not easy. We live in interesting times. Difficult days, for many of us. Some today are glad to see the year end. 2018 can’t get here fast enough. The year has been hard, a struggle. The headlines and news, overwhelming. Others, are sad to see this final day of 2017. They remember joys and successes, slowly fading to happy memories. Everyday is a transition, a moving forward towards the unknown of tomorrow. Finances and romances. Births and deaths. Stressors and pressures. Distractions from what’s important, sometimes so distracting that we forget what’s actually important. The world tells us this is important, and that is important. Society says occupy your mind with this idea and worry about that. Our own hearts tell us what’s important. The Creator of Heaven and Earth writes upon our souls the things that are truly important. Make time for this, our hearts say, it is not time for that. Sometimes we feel conflict in our spirits, because we are living as the world says to live, and not living aligned with God. There is a time for weeping, and a time for joy. A time to seek, and a time to lose. A time to keep and a time to throw away. A time to embrace, and a time to refrain from embracing. In the coming year, there will be hard times. There will be difficulties and disappointments. There will be frustrations and troubles. … joy comes in the morning. The year to come will bring with it untold joys, countless moments of happiness. Celebrations and graduations. Achievements and accomplishments. Growth and gratitude. 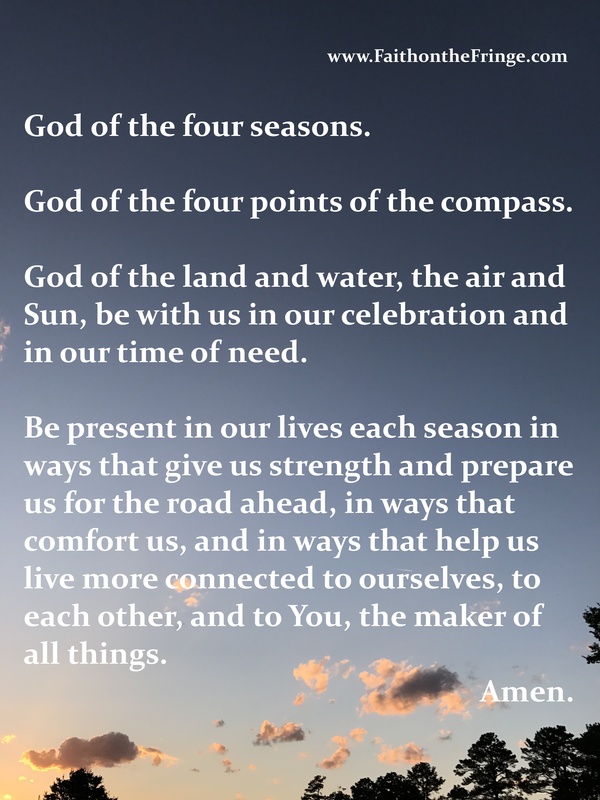 Let us thank God for the opportunity to celebrate each season of our lives. To pause and consider the joys and sorrows for what they are, as they unfold. Let us thank God for the chance to live our lives to the fullest, to be present and fully involved in the great gifts God has given us. Let us thank God for the year that has past, and the year to come. Let us thank God, that weeping lasts through the night, but joy comes in the morning. Delivered at First Mennonite Church Richmond, Dec. 31, 2017. This entry was posted in vocational ministry and tagged 2017, 2018, audio file, Ecclesiastes 3:1-13, New Years Eve, sermon. Bookmark the permalink.